Officially wowing Panama City Beach residents and visitors since opening its doors back in late June 2010, WonderWorks is a local favorite for family-friendly fun. This 35,000-square-foot, four-story facility claims to have something for absolutely everyone. And the adventures begin as soon as guests cross the unique, upside-down threshold. "A lot of people come through the door and say, ‘What is this place?&apos; " laughed Mike Walsingham, a Panama City Beach native and WonderWorks&apos; owner. "The only thing we&apos;ve really come up with is that it&apos;s an indoor amusement park mixed with an educational center." 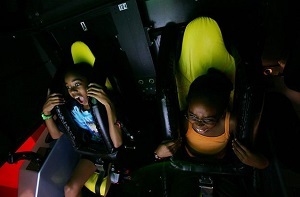 At WonderWorks, the good times are broken down into several interactive zones, which take guests through more than 100 hands-on challenges and experiments. Patrons explore topics ranging from natural disasters to light and sound research to space discovery. Admission is good for the entire day, so once you&apos;ve tried them all, revisiting your favorites is a breeze. "Everything in here is interactive," explained Walsingham. "You&apos;ve got to touch it, you&apos;ve got to throw it, you&apos;ve got to play with it, and you&apos;ve got to ride it." While the inquisitive learn about the deepest, darkest secrets of the Bermuda Triangle, the daredevils of the group can test their nerve with an assortment of "physical challenges," like lying on a bed of 3,500 nails or taking an XTREME 360 bike ride. Also included in the admission price? None other than a high ropes challenge course. Guests willing to upgrade their passes can also participate in a bout of "Laser-Tag." "When you look at it," emphasized Walsingham, "everything in here can have some sort of educational element - even the (simulated) rollercoasters." With other locations sprinkled across the country, the WonderWorks franchise has made quite a name for itself in recent years. 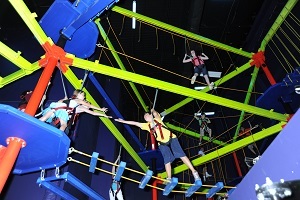 Geared toward kids of all ages, it&apos;s the quintessential example of family-friendly fun.